German and northern Alpine hay: art, nostalgia and therapy. Two weeks of August 2007 in southern Germany and the northern Alps reinforced the impression that loose hay-making, except in such relict landscapes as Maramures, is now almost completely confined to museums and such ancillary boutique industries as Heukur and Heubad. So this essay, necessarily short, will focus on art, nostalgia, and therapy. Admittedly, the weather was too overcast and unpredictable to encourage much hiking in the high Alpine meadows, although rumors of people scything and bundling hay up near the Swiss glaciers almost led to some serious mountaineering in search of two kinds of shrinking geographical phenomena. The wet summer evidently persuaded the modern, technologically sophisticated and risk-averse grass-cutters, not just of sub-Alpine Bavaria and Swabia but even in the high mountain meadows, to wrap their crops in plastic. As we have shown elsewhere, in the Wales to Wisdom essay, the textural and geometric simplicity of these forms give them an aesthetic appeal which is both minimalist and monumental. Here are a few new examples. Continue reading "German and Alpine hay." Maramureş 2007. Return to hay heaven. Finding himself in central and eastern Europe in the summer of 2007, the hay pilgrim again felt the irresistible magnetism of that northwestern region of Romania known as Maramureş, especially since a huge, traditional wedding of a beautiful Romanian friend would coincide with his visit, and especially since his inefficient but entertaining ramblings in search of hay in southern Germany and the northern Alps had proved to be less productive for the hayinart database. The summer was too wet and the technology too advanced to for any traditional haymaking to survive north of the Alps and west of the Carpathians. After a bizarre series of irrational journeys, from Germany to Geneva to Gatwick and back to Budapest, with a sideways shuttle to Beograd and back again to Budapest, he rented a PT Cruiser (like last year’s but cherry red), and drove six hours further east, to Eden. Explorers of this sprawling website may have stumbled across a suite of ten illustrated esssays on the magic of Maramureş, written a year ago. They will remember that this corner of Europe is one of the few where hay is made in the Bruegel style and where haymaking itself is a vernacular craft of the most appealing kind. And they will understand the appeal of the added incentive, the wedding of the daughter of Petru Berci (star of one of the finest hay photographs ever taken), an event which promised to be Bruegelian in itself. So here, in two parts, is an account of another week in Maramureş: first, some new hay discoveries; and second, some highlights of the remarkable wedding in Sarbi, an event which caused hundreds of celebrating villagers to set aside their scythes, rakes and forks for a whole weekend, and which, like other nuptials documented on this site, allows hayinart similarly to interrupt its primary industry. Continue reading "Maramureş 2007. Return to hay heaven." Ileana’s wedding: a ceremonial interlude from summer hay. "Ileana Berci's wedding was one of the most spectacular sights I've ever had the privilege to witness in Romania." -- Caroline Juler, author of the Blue Guide to Romania, Searching for Sarmizegetusa , and the newly published National Geographic Traveler Guide to Romania. Petru cuts grass and his face before Ileana’s wedding. Half-an-hour before his only daughter’s wedding was due to begin, Petru Berci was in the orchard, cutting grass for the animals. Later that night, he would leave the celebrations to feed them and milk the cows. During most of the ceremonies he would play a supporting role, serving tuica to the male guests, virtually invisible during the bridal procession and excluded, by tradition, from the inner, primarily god-parents’, circle in the biserica. Even at the night-long feasting and dancing at the community center, he seemed neither to eat nor dance, helping instead to wash some of the literally thousands of dishes in preparation for the long series of courses. He complained only once. Shaving with what appeared to be a dull razor, he cut himself repeatedly. Irritated more by the inconveniently messy blood than by the discomfort, he muttered untranslatable annoyance into the still quiet courtyard. Continue reading "Maramures 2007: Ileana's wedding." Bruegel’s seasons and hay on the walls of Prague. With the dozens of medieval seasonal scything scenes in mind, a recent viewing of Pieter Bruegel the Elder’s harvest painting a few blocks up Fifth Avenue from the Morgan Library stimulated a peculiar compulsion to see all five of the brillian Bruegel suite of seasons in a single summer. This entailed a pleasant trip to Prague, where, earlier this year, the greatest haymaking scene of all was moved into the city from a less convenient suburban castle. The other three are also reasonably close to Prague in the grand Viennese Kunsthistorisches Museum, which houses huge roomfuls other Bruegel masterpieces. And the Prague visitor whose vision is honed for the hay habit will find several other scythes on the walls of that great city. Mowing at the Morgan Library 1. Mowing motifs in months of Morgan manuscripts. The Morgan Library in New York City has one of the great medieval manuscript collections in the world. Within it is one of the world’s great collections of Books of Hours. And among their folios of illuminated calendars are dozens of illustrations of people, usually men, scything and sickling hay and grain harvests, accompanied, not in the fields but on the folios, by strange symbols that look like crabs or lobsters (cancer, the sign for June) or lions (Leo for July). The occupational and symbolic sequence is common enough that a quick trip on the Morgan’s outstanding online catalog “Corsair” (signifying the library of John Pierpont the capitalist or the Henry the pirate? ), in search of “June occupations” discovers over 40 manuscripts with mowers in their medallions or margins. French folios have mowing most often in June; and the Flemish, German and English folios, perhaps reflecting a more northerly haymaking season, have the scythe in the following month. Only once does the scythe, perhaps due to error or eccentricity, appear as late as August. The sickle, often with yellow grain crops, parallel stalks and more linear sheaves, is almost always on the folio following the scythe. Clearly the convention was for grain to follow hay in the agricultural and liturgical cycle. But a few cataloging lapses by the Morgan archivists have the scythe harvesting “grain,” perhaps trivial in their more lofty contexts, but significant in (H)ours. I hope that my own virtual harvest of the manuscript paintings and their systematic stacking in the hayinart database will illuminate iconographic distinctions in style and content. I have arranged them below in three sections roughly corresponding to centuries and stylistic shifts: the first showing conformity to the image of a single, simplified figure in a pose which is almost ideographic; the second reflecting rudimentary landscape themes and an emerging use of perspective; and the third celebrating complex agricultural and social activity. Each example has a pair of illustrations: an image on the page among other decorations of the text and the same image in isolation. The captions, sources and dates can be found by passing your cursor over the image. I hope that these juxtapositions will illuminate both the variety and consistency of this theme. To view the originals in their manuscript contexts, I recommend a virtual visit to the Morgan Library’s own splendid site . I have also interspersed, for comparison, a few famous Books of Hours, that somehow escaped the Morgan appetite for acquisition. Continue reading "Mowing at the Morgan Library 1." Mowing at the Morgan Library 2. Mowing at the Morgan 2: 15th century rustic landscape description. Two French Books of Hours from the early fifteenth century show less stylized more animated figures, recognizable rural landscapes, trees adding interest to the hayfield and giving a sense of depth to the image. Continue reading "Mowing at the Morgan Library 2." Mowing at the Morgan Library 3. Mowing at the Morgan 3: Rural narratives of the 16th century. In the Flemish Breviary of Eleanor of Portugal by the Master of James IV of Scotland (the very name reflects remarkable cosmopolitanism! ), complex haymaking detail is crowded into the lower margin of the July folio. June shows sheep-shearing . The Morgan dates straddle the fifteenth and sixteenth centuries, but the evident delight in the variety of activities, the appearance of women with rakes and forks, of draft animals, of haystacks with ladders, anticipate the rustic narratives of Bruegel. Continue reading "Mowing at the Morgan Library 3." Introduction: making a dream landscape real. How could I resist the persuasive testimony of so many friends and hay-lovers who claimed that the Maramureş region of northwestern Romania was hay heaven? Conscious that cultural change was inevitable and possibly imminent, especially in view of Romania’s apparent intention to join the EU, my wife Margaret and I traveled to Maramureş in September, 2006. We wanted to confirm the reality of the dream-like haystack-covered hillsides, we’d seen in magazines, guide-books and innumerable online websites. Continue reading "Maramureş 1. Introduction." The vernacular diversity of the Maramureş hayscape. What makes the Maramureş hayscape so remarkable is the survival not just of one vernacular style but the juxtaposition of several. Paradoxically, for millennia, this area has been both crossroads and frontier, accessible enough to armies from the west and south and hordes from the east to push its boundaries and beleaguered occupants back and forth, to leave alien words on its maps and in its dialects, and diverse customs and beliefs in its folklore and its churches. Somehow, the Maramureş cultural core has persisted at the remote fringes of many empires: Roman, Ottoman, Hapsburg, Magyar, Russian, Soviet, and Ceausescuan. Before the end of the first world war, it was part of Hungary; soon after joining Romania, it lost its lands north of the Tisza to that part of Ruthenian Czechoslovakia which now belongs to Ukraine. Clearly visible across the river, more heavily forested Ukrainian Maramureş appears to lack the delightful patchwork quality of what remains south of the border and what we celebrate here. Continue reading "Maramureş 2. Vernacular variations." Maramureş 3. September's second cut. A sunny September’s second cut. Most of the hay in this region, as in most of the northern hemisphere, is made in June and July, after the melted snow and spring rains have grown grass and flowers to a suitable height. In some years, given enough summer rains and September sun, there is time for a second cut. Fortunately for us, in 2006, August was very wet, and our visit the following month coincided with brilliant sunshine. So we were able not simply to gaze on grand scenery of serenely static stacks, but to participate in the activity of haymaking, witnessing the prehistoric process in all its phases, the shaping of an ephemeral landscape and its temporary structures, and the application of ancient tools by people who seemed not just to tolerate our enthusiasm but to welcome it. Continue reading "Maramureş 3. September's second cut." But on two of our days in Maramureş, in spite of this persistent optimal opportunity to dry and stack the hay and in spite of the apparently tireless energy of those who did the work, the fields were abandoned, first to observe the feast day of Santa Cruz (Sfânta Cruce) and then for the usual Sunday of rest. Piety trumped the practical imperative to make hay while the sun shone. Ana told us a local legend on the price of non-observance. A farmer who made hay on Saint Peter’s Day saw his stacks turned to stone, and Ana showed us the proof: two cottage-sized rock formations on a hillside above Şurdeşti . So we too observed the feast of Santa Cruz, our own home town. And on Sunday we went to an Orthodox mass in an unorthodox, open-sided chapel above the Biserica of Sârbi. From here, during the moving but interminable and incomprehensible service, I could watch and worship, for several hours, the sun continuing its work alone in the half-cut hayfields across the valley. Continue reading "Maramureş 4. Religious interludes." Maramureş 5. Making and stacking hay. Around these holy intermissions, we watched the classic, secular narrative unfold. After the early morning scything, the flattened grass and flowers were left for several hours until the dew had left them. Then the tedders, women with rakes and men with forks, came to turn and toss the half-dried hay into loose windrows. By the end of the first day, if the air had been warm enough, these rows were consolidated into waist-high mounds. Damper weather or a denser crop, rich in broad-leafed herbs, would limit the rate of the mounding or the size of the mounds. Where the incipient hay was especially heavy, it was hung on the stakes and racks, raised from the moist ground, protected from the next night’s dew and shaped to shed unexpected showers. Drying strategies varied, in their details, from valley to valley, village to village, and meadow to meadow, according to subtle custom and conditions. When the hay was dry enough, the mounds were poled towards a platform made of logs and twigs, the imminent stack’s protective foundation, surrounding a tall pole, its supportive spine. The stacks took two or three hours to build. Continue reading "Maramureş 5. Making and stacking hay." Maramureş 6. Architecture and husbandry. The architecture and husbandry of Maramures hay. We saw parts of this process repeated, with minor variations, weather-proofing domes of hay throughout Maramureş. In some fields the stacks were clustered like affectionate families; elsewhere they were scattered equidistantly. Continue reading "Maramureş 6. Architecture and husbandry." Maramureş 7. Technology and culture. Middens to mechanization: technology and culture. The medieval hay landscapes of Maramureş are glorious relics, preserved and annually renewed by the hands and muscles of local farm families. The repetitive intensity of the work required, mowing, drying and stacking the hay with wooden tools, and transferring it successively with poles and wagons and sleds from fields to stacks and farmsteads, is unlikely to survive the temptations of labor-saving technology. Already the signs of cultural transition are evident: satellite dishes share wooden balconies with drying vegetables; washing machines save women from bitter visits to the traditional wooden whirl-pools in icy winter rivers; in-house plumbing may soon subvert the ubiquitous out-houses near the cowsheds; and middens in which human and animal waste are mixed may not survive international regulations, if and when Romania joins Europe. Continue reading "Maramureş 7. Technology and culture." Maramureş 8. The Baia Mare School. Maramureş hay in art: the Baia Mare (Nagybanya) School. Once the metropolis of Maramureş, Budapest is now of course in another country. But the Hungarian National Gallery preserves several paintings of Maramures hay from a century ago when several post-impressionists moved from the capital to the ancient mining town known as Nagybanya or Baia Mare. This art colony in the provinces had many 19th century precedents in western Europe and New England: the Barbizon school; Pissarro and Cezanne in Pontoise, Gauguin and Bernard in Brittany; the Hudson River School ; I Macchiaioli in rural Tuscany; and others. Each of these schools was inspired by nostalgia for a rural landscape that was already disappearing; many of their members found in the traditional haystack, a perfect symbol for agricultural ephemera. Those who took their easels into the villages and hayfields of Maramureş would have been pleased to see how much of the scenery would remain unchanged for another hundred years, continuing to inspire artists, craftspeople and photographers in the twenty-first century. Continue reading "Maramureş 8. The Baia Mare School." Continue reading "Maramureş 9. Open air museums." Continue reading "Hay Life List"
Resting in the hay (1592-1900). Having followed a rigorously reversed chronological sequence in arranging our images of resting in the hay from the past century, we shall look at the older part of our collection (the rest of the rest) more thematically. My first example is the most recent discovery, found by carefully browsing the huge Athenaeum collection for the umpteenth time. As noteworthy for its title (translated as “Tedders at the end of the day”) as for the accuracy of its depiction of young women haymakers resting on the grass they've just turned (tedded). The setting is an orchard, and the costumes appear to be Breton, a region which the artist Theophile-Louis Deyrolle often painted. The discovery is disconcerting only because it was made more than two years into our project, thanks to the Athenaeum site's continued expansion. Our other two introductory paintings were created more than a decade and half a continent apart but are closely similar in theme and treatment. The Hungarian Istvan Csok was heavily influenced by the more famous Jules Bastien-Lepage. Nowhere was this influence more evident than in this pair of paintings of haymakers at rest. Specifically, as Gabriel Weisber has noted, in Csok’s 'grouping of the peasants in the field and [in] the re-creation of the languorous atmosphere.' But the utter exhaustion of the girl in Bastien-LePage's work is replaced here by gentle relaxation, and the costumes are more specifically ethnographic than in the French image. The texture of the windrow on which the girl is lying is very well depicted. Continue reading "Resting in the hay (1592-1900)." Resting in the hay (1900-2005). Even more current than John’s photograph is this perfectly-timed panel in a Wizard of Id comic strip which appeared on Sunday, October 23, 2005, the day after my birthday! Continue reading "Resting in the hay (1900-2005)." Haystack Butte: a triangle of coincidence. As has often been remarked, internet “publishing” creates and fosters active communities of interest and brings together people from all over the world. Even an arcane blog like this one has attracted active contribution in the form of comments from over a hundred people, among them historians, geographers, sociologists, anthropologists, librarians, artists, poets, ranchers, cowboys, and of course friends and family. So, in spite of the unstoppable putrid spam which oozes through our filters, we’ve kept the comments door open. (Please keep on commenting. Ignore the error message that may greet your comment and imply erroneously that it has not been received.) The following correspondence, lightly annotated [in italics], illustrates the way a comment can open a new path of discovery which leads back to a place already visited and people already known. The place is Haystack Butte, one of several western landforms with that name, located about 50 miles west of Great Falls, Montana. The people are Meriwether Lewis (who passed Haystack Butte 199 years ago and called it Shishequaw) and several members of the Clary family to whom I am related by marriage, who celebrated both of the weddings in our Wedding Bales essay, and who once ranched on the land surrounding -- Haystack Butte. Continue reading "Haystack Butte: a triangle of coincidence." Silage on Seven Devils Road. Abandoned silage bales, Seven Devils Road, north of Bandon, Oregon, August 2005. Coastal Oregon can be damp and cold enough to make even the summer traveler wear winter clothes and the hay maker to wrap his bales in plastic covers more reminiscent of wet Wales, than of the hot, dry American West. I found these silage bales from an earlier season, left to decay on a typically chilly August day. The fog extended only a few hundred yards inland, but the damp air sucked by the inland heat penetrates many miles up the Camas Valley. Beyond the first protective ridge, humidity drops, temperatures soar, and hay can be made without protective plastic. But these abandoned packages, mysterious detritus of industrial agriculture, have their own peculiar beauty. The uncertainty of their abandonment to ferment and decay provoked enough metaphors to string together the following sonnet. Continue reading "Silage on Seven Devils Road." From Wales to Wisdom: wet and dry hay in the West. Halfway between Wisdom and Jackson, in the Big Hole Valley of southwestern Montana, 83 year-old Jack Hirschy and his family still make the kind of hay the earliest ranchers once made by hand in this basin between the Beaverheads and the Bitterroots. For much of the year, the ground is frozen hard; then, after the spring thaw, the grass grows quickly in a virtual swamp. By July the ground and the air are dry enough to allow an army of workers, young and old, but now much diminished, and hay-making machines, old and new, into the vast, waist-high meadows. This essay will report on these two western hay-field-trips, made in the summer of 2004, one to the damp west of England and Wales, where hay has been made virtually obsolete by new technologies, and the other to the western United States, where the combination of semi-desert air and well-irrigated valleys still produces a magnificent variety of hay landscapes and hay shapes. Continue reading "From Wales to Wisdom: wet and dry hay in the West." During the past four summers, I’ve attended two Montana weddings both of which used hay-bales as rustic pews for those attending. The first was at a ranch near Utica where hay is important enough for the annual What the Hay Festival to have become the state’s number one tourist attraction. The bales were arranged in concentric circles around a tent which sheltered the ceremony from the sun and from ash falling out of the fire-browned sky of the year 2000. The second, in August 2004, also included bales and a tent, but was much more exotic to northern Montana. A self-defined “mix of Sindhi, Irish, Scottish, Sikh, Jewish, Quaker, Sufi, Norwegian, Buddhist, and Montana traditions” the ceremony and the tent (mandap) where it was held were fundamentally Vedic. The vivid color of the mandap, garlands, and offerings contrasted brilliantly with the setting: a meadow ringed by an aspen grove, close to an old Metis cemetery, on the slopes of Ear Mountain in the Rocky Mountain Front, 25 miles west of Choteau. Continue reading "Montana wedding bales." Continue reading "Dixton Manor haymaking: a visual encyclopedia." Roles in the hay (play). The phrase “roll in the hay” is widely understood as a euphemism for making out (or making love), even by those who wouldn’t dream of exposing citified skin to our scratchy rural material. This essay will explore such rolls, from the early 16th century to the 1990s, from a drawing by Altdorfer to eighteenth century naughtiness of Rowlandson and Fragonard, from gentle Victorian flirtations to pinup publicity photographs of Jane Russell and Raquel Welch. Details from two images introduced in our other Roles in the Hay essay show the close relationship of hay with women’s roles, rolls, and rakes: at left, the crowded Jorg Breu 1521 haymaking scene in which women with rakes flirt with rakes; and at right, the crudely carved seventeenth century woodcut, originally captioned "Making hay while the sun shines.” Behind a woman working with a rake another sits by a haycock on a man's lap. Through the middle of the twentieth century, in Devonshire, there was "a custom that each new rick of hay should be slept on by a young man and a girl, in order to ensure that the hay would prove sweet, and the fiancée pregnant." 1953 R. DUNCAN in the Oxford Dictionary of Superstitions. Continue reading "Roles in the hay (play)." Roles in the hay (work). Roles in the hay, rolls in the hay, women and rakes. The purpose of this essay is primarily to explore aspects of gender related to hay, primarily the “role” that women have evidently played in its production, especially during the long pre-mechanized phase when hay was mowed, tossed, moved and stacked by hand and in the many regions where balers are still unaffordable. In most pictures of most times and places, women are associated with a single tool, the rake, used for moving drying grass along the ground or tossing hay just above it. Occasionally, perhaps increasingly, they are shown using forks, but generally the work of pitching the hay onto a wagon or stack is reserved for taller, stronger men. While women are sometimes shown using sickles in grain-harvest scenes, they are almost never associated with scythes. The image at right is one of several fine women haymakers by Julien Dupre, courtesy of the Rehs Galleries, Inc., New York City. Continue reading "Roles in the hay (work)." Water and hay do not normally go together. Water is definitely not welcome when cut grass is drying into hay. But, in the pre-rail era when heavy, bulky goods had to be moved long distances, rivers and canals were used as transport networks, and waterborne boats and barges were common hay vehicles, not only into big cities like Paris and London but out of New England coastal marshes and around San Francisco Bay. This essay brings together several images of waterborne hay and waterside haystacks, the pre-industrial equivalent of tankers and refineries. The delicate work to the left, appropriately enough, is a watercolor, by George Chambers (1803-1840), one of two marine paintings in the Tate Gallery by this short-lived artist. As in our other essays, images are clustered by sub-theme: seventeenth century Holland; Empire Paris and Edwardian London; eastern England; rural France; hay-boats around the shores and waterways of the North Sea; and finally smaller hay sailboats from France, New England, and northern California. Continue reading "Hay on water." In both art and literature, hay is associated most commonly with high summer, the season of its production, but its primary importance is surely experienced in winter, the season when animals are most heavily dependent on it for their survival. Hay stores and conveys the growth of summer and the energy of long days and the high sun from one solstice to another. Haystacks, burrowed into, were the thatched cottages of the rural homeless, of dogs and cats, and the rodents on which they preyed. Hay made the beds both of vagrants and the the legendary bairn of Bethlehem. And winter hay attracted at least a few painters for its vivid golden hint of June among the black and white austerity of dark December. Several Impressionists tried to capture the elusive 'effets de neige' the flickering reflective effects of snow on winter landscapes, both urban and rural. Monet's famous meule series, (grainstacks, alas, not hay, and consequently disqualified from this essay) contrasted the warm complex color of the straw with the equally complicated reflectivity of the surrounding snow. This more homely Camille Pissarro painting (Farm at Montfoucault, snow effect. 1876) shows a farmer, followed by a sheep, carrying a bundle of hay into a snow-covered farmyard. Austere whites dominate the composition, but there is warmth in the stone walls of the farm buildings, in the sheep's fleece, and especially in the hay. This essay, one of several at our hayinart.org web-site, brings together a few other works of hay in winter to celebrate the winter solstice and to send season's greetings to our friends. Continue reading "Hay in winter." One of the delights of webwork is that the risks of open access are more than offset by the benefits of wide exposure to the gaze of expert strangers who often become instant friends. An especially gratifying example of this virtual community development has been the email we’ve been receiving from John Hutchinson of Salem, Mass. John is as interested in the traditional salt haymaking in the marshes of the Atlantic coast as we are. And he’s certainly more knowledgeable. He’s kindly given us permission to upload his comments, paintings and photographs to our site. So here they are. Continue reading "Haystacks on Trajan’s column." Hay in art and literature: an outline of themes. In the introduction to his remarkable study of that small, humble object, the pencil, the engineering historian Henry Petroski noted that it “is so familiar as to be a virtually invisible part of our general culture and experience…” I am exploring a similar theme, equally hospitable to an eclectic and multidisciplinary approach. My subject, humble hay, has for millennia been a crucial part of human existence, an important catalyst in the transformation of humans from hunters to herders. Unlike other inventions which were part of the origin and dispersal of agriculture, hay was developed without requiring the patient, experimental domestication of specific plants. Unlike the noble grains, grass grew wherever livestock grazed. Cutting, sun-drying and storing herd animals’ native fodder helped save herder and herds from seasonal deprivation, slaughter or migration. The preserved surplus allowed animals and their dependents to survive cyclical duress, or seasons and years of insufficient rainfall or sunshine. Continue reading "Hay in art and literature: an outline of themes." Missed stacks and mistakes: distinguishing between hay and straw and other heaps. Because very few artists and art historians were also farmers, many of the so-called “haystacks” in western art actually depict stacks of wheat or other grain crops. For centuries before the hay-baler and combine-harvester dropped bales of similar dimensions in hayfields and wheat-fields, haymaking and harvesting created very different landscapes. In many parts of the world they still do. Continue reading "Missed stacks and mistakes: distinguishing between hay and straw and other heaps." 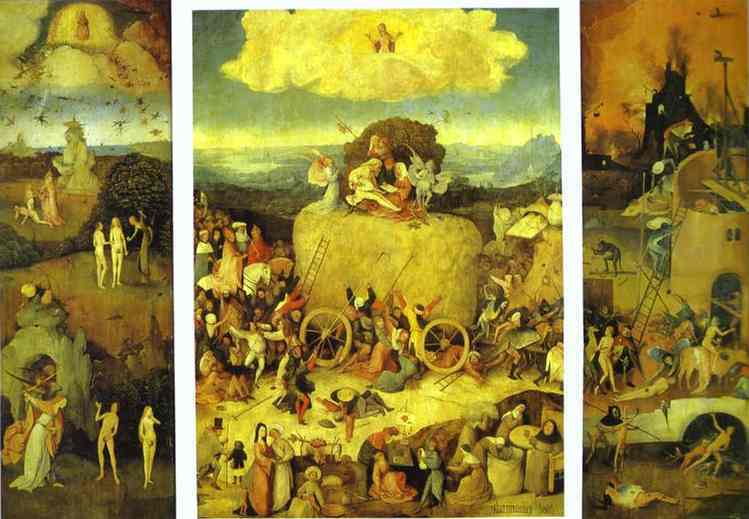 Bosch's Wain's world: hay symbolism in the sixteenth century. The wonderfully varied symbolic and metaphoric associations of hay mirror its cultural and economic importance in the history of humanity. Hay has variously symbolized wealth and poverty, sexuality, love, life and death. The somewhat dated saying in our own culture "That ain't hay" (meaning "that's not entirely worthless") is remotely connected to the beliefs and rituals of the Low Countries of Europe over half a millenium ago. Below we quote at length from a brilliant iconographic analysis of the meaning of hay in 16th century religious art. While the most famous examples are the two versions of the "Hay Wain" of Hieronymous Bosch, the same theme is illustrated by Hogenberg's "Al Hoy" (a 1559 etching), "The Hay Wain" (an anonymous 16th century engraving), and "Christ Sitting on a Haystack" (an anonymous 16th century etching). Our text is also illustrated by the astonishing 1550-70 tapestry by a Brussels workshop, "Hay Wain in a Globe." Continue reading "Bosch's Wain's world: hay symbolism in the sixteenth century." Introduction to the hayinart database. Hay in art: table of contents. Introduction to the poetry of hay. Hay poems in popular magazines since 1798. Hay poems of the late twentieth century. Twentieth century hay poets born before 1940. Hay poems by Hughes and Heaney. Hay poets born in the late nineteenth century. Marsh hay poems of John F. Herbin. Hay poets born in the early nineteenth century. Hay poems in the vernacular of William Barnes. Early hay poems from Lydgate to Hood. John Clare poems on hay. A Gazetteer of a Hundred Hay Places. Altoon Sultan's ambivalence: the new agricultural landscape. William Marshall and eighteenth century hay. Hay in winter, part 2.